What meaning does the Forbidden City have for China and outsiders alike? The palace symbolizes what, after a century of repudiation, is now regarded as being China's proud imperial past. The palace and its intrigues, its mystique and its history have played a central role in defining both Chinese and Western perceptions of China. For all of the destructive change that has been visited on the Chinese capital in the last 60 years, the Forbidden City remains. There has been a tendency to conflate the intricate design of the palaces with the nature of the Chinese people and society as a whole. Tales of dark plots and savagery at the court would repel and intrigue people in China and throughout the world. “Around the emperor, the glittering and yet mysterious court throngs — malice and enmity clothed as servants and friends, the counterbalance to the imperial power, with their poisoned arrows always trying to shoot the emperor down from his side of the balance scales. This may be a fanciful description, an oriental fantasy, but it also echoes the views some 20th-century Chinese had of their own country’s dynastic past. Like the Great Wall of China, the Forbidden City has a metaphorical life, and it has provided an abiding alibi for misunderstandings. Both the reality of an imperial court sequestered behind the vermilion walls of the Forbidden City in Beijing and the mysterious, but none the less powerful, perception of a secretive and hidden world at the heart of the enigma of China have contributed to the image of an inscrutable, capricious and cruel regime. The Empress Dowager Cixi, who dominated the Chinese court for nearly 50 years from the mid-19th century, personified the untold story of the Forbidden City. Tales of dark plots and savagery at the court of the Empress Dowager would repel and intrigue people in China and throughout the world. From her time, writers have been beguiled by the architecture of imperial Beijing and quick to employ the language of court politics to describe events there. Not only that, but in many films, novels and plays, as well as in journalistic accounts, both Western and Chinese, there has been a tendency to conflate court secrecy, traditional politics and the intricate design of the palaces with the nature of the Chinese people and society as a whole. The palace and its intrigues, its mystique and its history have thus played a central role in defining both Chinese and Western perceptions of China. In 1912, upon the fall of the Qing dynasty, the Republic of China was founded. Its first president, Yuan Shikai, established his offices in the Lake Palaces, the imperial pleasure gardens adjacent to the Forbidden City. The Republic endured an unsteady rule beset by internecine strife, followed, in the 1930s and 1940s, by invasion and occupation by the Japanese. After a short-lived post war peace, a titanic struggle broke out between the Nationalist rulers of the Republic and Communist insurgents who had grown strong during the struggle with Japan and whose clean-living image offered a stark contrast to the rampant corruption of the old regime. Thirty-five years after the fall of the Qing dynasty — at the time of the creation of the People’s Republic of China — Mao Zedong and his comrades also chose to locate their Communist government in the former imperial enclave of the Lake Palaces. This only reinforced the impression, however, that, while rulers may come and go, the system as well as the habits of Chinese autocracy stay the same. As Franz Kafka put it, “the empire is immortal.” As much as Mao and his fellow revolutionaries might rail against the habits of the feudal past, their language, literary references and political infighting were carried out in its shadow. The palace, a metaphor for Old China, persisted as a metaphor for New China. Mao and his comrades did not have a comfortable relationship with the Forbidden City, however, and they even considered demolishing it or converting it for other purposes. They were a revolutionary force far more radical than their Republican predecessors. They occupied Beijing and gradually displaced its original citizens. New Party activists worked hard to mobilize the expanded population to join in a mass campaign to refashion the ancient capital. Mao himself refused to enter the Forbidden City after 1949 but, inspired by the Soviet inhabitants of the Kremlin (and the advisers they sent to Beijing in the early 1950s), he and other Party leaders imagined moving into a modern “Chairman’s Office” built opposite the palace, a socialist edifice that would outstrip in scale and majesty the Hall of Supreme Harmony, the largest wooden building in China and the formal center of dynastic power. In the late 1950s, when surveying the newly created expanse of Tiananmen Square (built on the former Imperial Way that led to the Forbidden City), Mao famously remarked that one day he hoped to look out on a vista of factory chimneys. Today, the visitor who ascends the Gate of Heavenly Peace — the grand entrance to the Imperial City that features a rostrum built for Chinese Communist Party leaders to review mass parades — is lucky to see anything at all. Beijing’s few smoke-belching factories were mostly relocated in the run up to the 2008 Olympics, but the smog haze of hyper development still blankets and obscures the city for much of the year. The walls of old Beijing have long since been razed, as have most of the neighborhoods that reflected the city’s ancient temper. Yet for all of the destructive change that has been visited on the Chinese capital in the last 60 years, the Forbidden City remains. It is unique, the most tangible symbol of a Beijing that is no more. In the 20th century, the Forbidden City became a monument to the passage of dynastic China. Today, the Palace Museum that occupies much of the sprawling Forbidden City is one of the major tourist attractions of China’s metropolitan capital. It showcases (albeit in museological rivalry with the lavish National Palace Museum in Taipei) the material heritage of the nation. It symbolizes what, after a century of repudiation, is now regarded as being China’s proud imperial past. 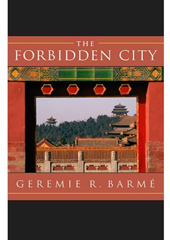 Editor’s Note: This feature is adapted from THE FORBIDDEN CITY, by Geremie R. Barmé, published in May 2008 by Harvard University Press. Copyright (c) by Geremie R. Barmé, 2008. Used by permission. All rights reserved.